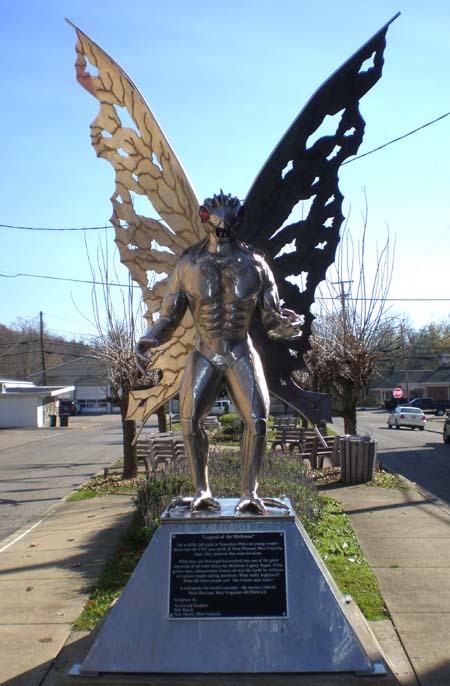 This weekend (September 14, 2012) is the 10th anniversary of the Mothman Festival in Point Pleasant, West Virginia. I am pleased to be part of the speaker lineup again this year, and if you are able I highly recommend attending this free fest. Mothman’s fame may be in West Virginia, but Canada certainly is part of this creature’s world itinerary. Sightings occur worldwide, and have for a very long time. If you are not familiar with this cryptid, here are some basics. First and foremost, know that not everyone considers Mothman a cryptid. Some believe he is thoroughly paranormal, some believe he is alien, and skeptics have both pooh-poohed the sightings and attributed them to barn owls or sand hill cranes. Most witness descriptions place him at 4 to 6 feet and human shaped, having a shiny dark grey or black skin, batlike wings, and large glowing red eyes. He is able to fly without flapping his wings, take off and land vertically, and has sharp fingernails. In 2002, the motion picture “The Mothman Prophecies” starring Richard Gere was released by Lakeshore Entertainment and Director Mark Pellington. Most people have, unfortunately, gotten their information from this film. Based on the book by John Keel, the movie describes some of the event of the mid 1960’s in Point Pleasant and the Mothman involvement. While an entertaining film, it is so factually incorrect and veers so far from the original book, that witnesses and locals in the Point Pleasant area tend to avoid any association with it. Any serious researcher should purchase and study the books by Jeff Wamsley on the subject. While not a witness himself, he has collected newspaper accounts and police reports and real evidence from the period. Additionally, Wamsley runs the local “Mothman Museum” and is instrumental in the planning and execution of the yearly festival. His books are called Mothman: Behind the Red Eyes, and Mothman: The Facts Behind the Legend (written with Donnie Sergent, Jr.) and are available at Amazon. Mothman reports have come in from many countries. Viet Nam, Mexico, and The Ukraine have notable sighting reports. Native American cave art depicts drawings of creatures quite similar to Mothman as well. He has also been sighted just before other major world disasters including explosion, the Tsunamis in India and Japan, Afghanistan and Iraq, and in New York on September the 11th. In Canada, there are but a few sightings thought to be attributable to Mothman. One witness reports that in August of 2007 in Ontario, Canada, heard a loud rustling sound in some tall grass. When the creature emerged it is described as having large, bright red eyes. The creature was about seven feet tall, black shiny skin that looked like a bat's, long arms that reached almost to the ground, and a wingspan of about eight feet wide. It let out a loud blood-curdling screech and the witnesses ran. A police report was filed but never taken seriously. Later the same night the witness heard a scratching sound on the window and went to see what it was and it was the tall, dark creature peering in the living room window. Two weeks after the occurrence, the house had burned down. Similar stories trickle in from across Canada. Sightings have occurred from Dawson City, Yukon, to CFB Gagetown near Frederickton, New Brunswick. 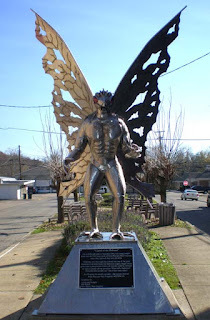 As a West Virginia native and Mothman witness myself, I ask that if you (yourself, not via heresay) have seen this creature, please contact me. I have research ongoing.